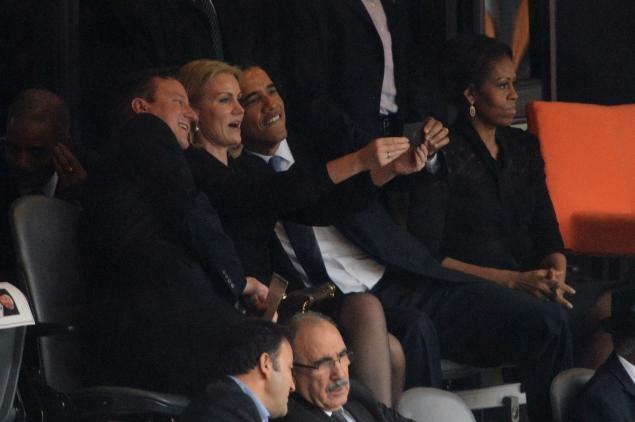 The President of the United States—in attendance at the state funeral of an international figure—chose to use some of his precious time taking “selfies” with other world leaders. Does it make him “real”? Yes. Does it make him “likeable?” Maybe. Does it make him a good leader? No. Winning the presidency and governing thereafter wasn’t supposed to be about winning a popularity contest. It was supposed to be about leadership. Just as a child needs a parent and not a “buddy,” the country needs a leader, not a bro. Being a personally likeable person does not exclusively make a good president. It’s part of the equation, to be sure, (nobody wants a bore) but we’re supposed to judge a leader by results, not charisma. “If you like your insurance, you can KEEP your insurance.” – said Barack Obama to the American people . . . 29 times. Then there’s Benghazi, where he sent administration officials out (including the former Secretary of State Hillary Clinton) to claim that there was absolutely no evidence to support the idea that the attack on our consulate was pre-meditated. There’s the IRS scandal, in which conservative, Tea Party groups were targeted and administration officials proceeded to lie about it. There’s Fast and Furious where the administration covered up a gun-running scheme that resulted in the death of an American citizen. There’s the wiretapping of reporter James Rosen, in which it appears that the president’s Attorney General lied under oath to Congress. Last, but certainly not least, there’s mounting evidence to suggest that the unemployment numbers just prior to the reelection of Barack Obama were tampered with. History shows us that no incumbent president has been reelected with unemployed numbers over 8% . . . so they weren’t. Despite market indicators to the contrary, unemployment took a fairly steep drop to 7.8 percent from 8.1 percent. Scenario 1: If he really didn’t know what was going on, that’s a mark on his involvement level and his leadership skills. No leader can know 100% of what’s going on, but he’d better make it his business to know 99.9999999% of every last painful detail. And in the event that his lack of knowledge of some problem exists, he takes full responsibility. Any company would expect no less of its CEO (male or female). Either way . . . there’s shame enough to strip the president of the laud that Lynch provides here. Believe me—nobody (include yours truly) wants to call the president a liar. No one wants to accept the fact that an office we’re all taught to revere and honor could be capable of such acts. Yet, today I present you with the sad reality.